members, promising plans for new security measures. PFF, Rarotonga, COOK ISLANDS Wed 15th October 2014-- Regional media rights monitoring network the Pacific Freedom Forum, PFF, has called for swift and decisive action from the Papua New Guinea Police following the abduction and sexual assaults of three women journalists on Monday 13th October. While Police say they are 'waiting' for medical findings and talks with the victims to guide their investigation, news reports say a bus doing evening drop-offs on Monday 13th October for staff working at the National Broadcasting Corporation, NBC, was taken over by a group of men in a settlement area in the national capital, Port Moresby. The men ordered the driver and all NBC male staff out and drove off with the three females on board. Police found the vehicle and the women abandoned by their attackers later that evening in another part of the city. Two of the women were hospitalized with injuries from their ordeal. "Pacific media colleagues condemn and denounce these attacks and call on Police to act swiftly to bring those responsible to justice," says PFF co-chair Titi Gabi of Papua New Guinea. "The safety and security issues facing women journalists on the job, as well as getting to and from home, are a huge concern for women media workers in Papua New Guinea, where sexual and all other forms of violence are a major obstacle to their ability to do their jobs well." 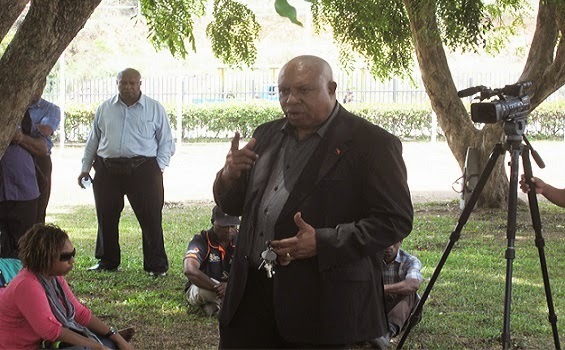 Colleagues of the media workers employed by the state broadcaster of Papua New Guinea, the National Broadcasting Corporation (NBC) staged a stop work protest yesterday over their long-standing pleas for security. Transport for workers is a key feature of job and personal safety for many, but women journalists working evening hours face increased threats to their personal safety and are often the target of sexual harassment. "We commend the staff for stepping up their call on their bosses, and NBC's management for hearing the grievances of staff and quickly committing to support the three women as well as step up transport with private security for their bus routes," says Gabi. "We especially commend the provision of counselling support to those affected." PFF Co-Chair Monica Miller of American Samoa conveyed support and solidarity from regional colleagues to the victims of the attack. "Our heart-felt thoughts are with our colleagues through their healing even as we are aware sexual assault against women is not uncommon across our societies as a whole. But our employers, the state, and all of us as individuals must do more to stop the culture of impunity when it comes to already-high levels of sexual violence against our Pacific sisters in Papua New Guinea," she says.